People have to understand: I felt like it was my fault, like it was my responsibility, that the Falcons franchise had been set back. And if Matt had been a bust … then my guilt over the harm I’d caused the city would have only grown worse. So, yeah, I’m human. It hurt when the Falcons drafted Matt. And for a while there, for sure, I was envious of Matt’s position. But Matt being such a success — that’s been a joy for me. For me, that’s been relief. It’s been peace of mind. And the same thing goes for this MVP season of his (he’s got my vote), and this amazing Super Bowl run (I’ve got the Falcons winning, 23–16). Joy, and relief, and peace of mind. And that’s what I mean, when I say that Atlanta is family. Family isn’t just about when it’s good for you, or when it’s convenient, or when the love comes easy. Family is about when the love comes no matter what. Either Brady or Ryan will become more and more. To a very casual observer, a mid-December post on the 6-7 Atlanta Falcons would cry out for a Dickensian introduction, but it simply has not been a tale of two halves for these dirtier-than-anticipated birds. On film, the 1-4, Stage 2 Falcons haven’t looked significantly different from the Stage 1 Falcons who started 5-0. And, OK, maybe the Stage 1 Falcons were not quite as good as their record indicated, but those five wins are a more accurate portrayal of the 2015 Falcons than the club’s four losses. The biggest difference between Stage 1 and 2 has been the dreaded turnover. [T]he Falcons have beaten themselves with random fumbles and a few interceptions, of which only one was a truly bad offensive play. Ryan, cerebral as he is, has always had a slight tendency to take the bait and make a foolish throw or two into disguised or tight coverages. 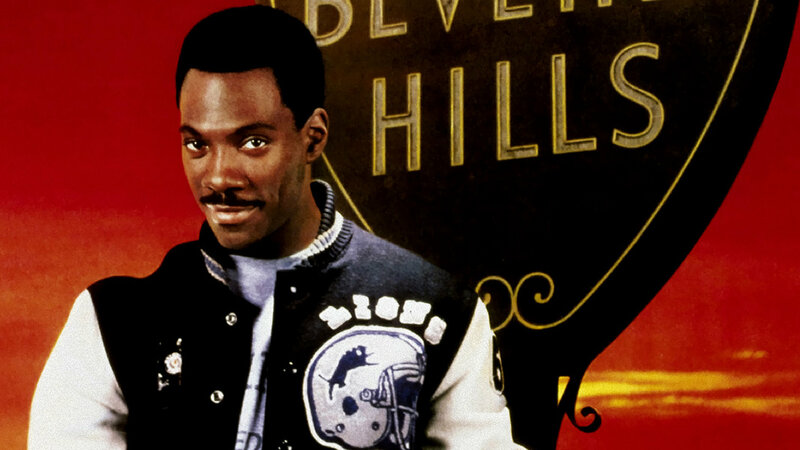 But interceptions have never been a major bugaboo. So unless you believe this will change in the final six games of Ryan’s eighth NFL season, there’s little reason to believe turnovers will continue to plague Atlanta. Most likely, Atlanta’s fate hinges on how well its offense functions. Combine the Stage 1 Falcons with the Stage 2 Falcons and what you’ll likely get is a Stage 3 Falcons club that finishes 10-6 and is a dangerous Wild-Card foe. The seductive simplicity of Benoit’s thesis really is too good to be true. It seems easy to pick on him three weeks later, when Atlanta dropped all three games in that period and has an active six-game losing streak, but his reasoning would’ve been flawed regardless. Even if it’s true that turnovers– both fumbles and interceptions– fall within the realm of luck, and even if it also is true that the Falcons’ then-recent losses were due to turnovers, Benoit ignores the possibility that the team’s early successes also were due to luck. Instead, he simply assumes, without offering any evidence to that effect, that the team was playing closest to its true-talent level when it opened up 5-0, rather than when it went 1-4 (now 1-7, the same record with which the Detroit Lions opened the season). Couldn’t good luck have played just as much a part of Atlanta’s 5-0 opening as bad luck did in their subsequent losses? Of course, but in his overly rosy evaluation of the early season Falcons, Benoit apparently didn’t consider that. At 6-7, Atlanta isn’t mathematically eliminated from playoff contention, but, with another game against the Panthers remaining and the Seahawks surging, they’re very likely done for the year. In erasing their 5-0 start, the Falcons’ poor play in the last few weeks likely is a closer approximation of their true talent level than their results in the first five weeks. Indeed, as these charts illustrate, they’ve been historically bad from Week Six onward. For postseason purposes, Atlanta no longer controls its own destiny (scenarios), but, at a minimum, it will need to beat its three remaining opponents– Jacksonville, Carolina, and New Orleans– to have a shot. According to FiveThirtyEight, the Falcons have a two-percent chance of making the playoffs, and their projected win probability this week against the Jaguars is fifty percent. Not great, Bob. Detroit football fans living in Atlanta were treated to a fleeting moment of excitement upon the release of the 2014 NFL schedule, which showed the Lions and Falcons meeting in a Week 8 home game for Atlanta. That moment of excitement fleeted as those fans noticed the kickoff time, 9:30 am, and further investigation revealed the location of the game to be London, England, Great Britain, United Kingdom. Remind me again why we fought the Revolution? 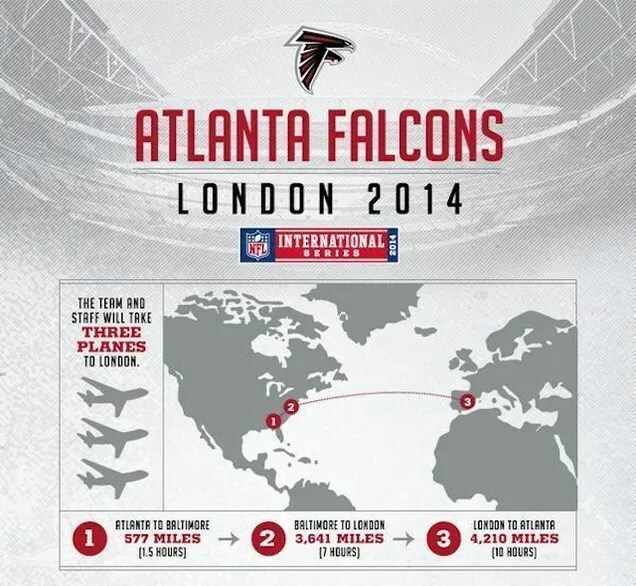 The truth is, after their team’s disappointing start, Falcons fans probably are less worried about their team showing up in Spain for a game in London than they are about the fact that there apparently are no direct flights from Hartsfield-Jackson to Heathrow. He’s done. He can’t take another year. The grind of football has exhausted him, and the grind is just now starting. It’s July. He’s in the weight room of his Huntington Beach home, in a gated community only miles from the projects where he was raised. He is about to work out, because his 37-year-old body might not last 16 games otherwise, because he has played in the NFL for 16 years and knows no other way. He is a physical wonder, sculpted to the last inch, but the imperative to work out is more draining than the workout itself. His body seems to be outlasting his will, rather than the reverse. 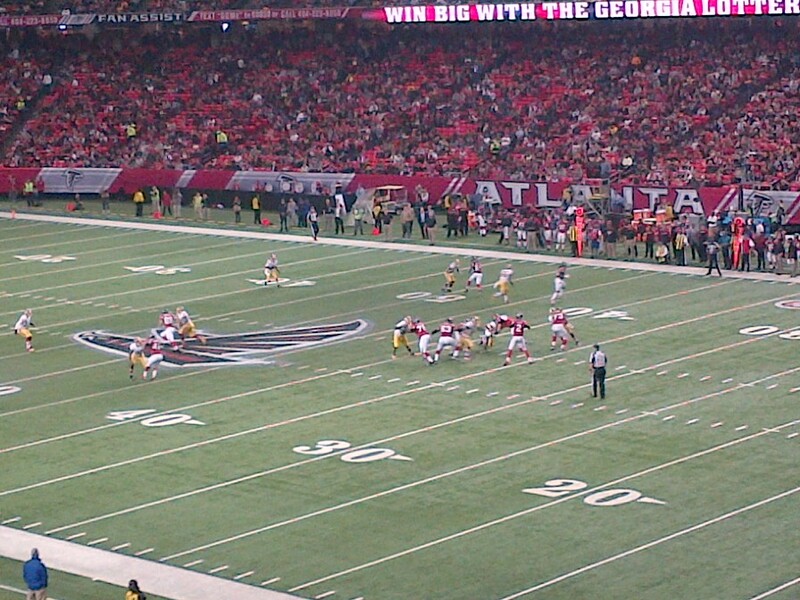 As reported, I was on hand to watch the Falcons host the Redskins (Monuments?) yesterday afternoon, and it was everything you’d hope a late-season pairing of three-win teams would be. Atlanta’s offense was boring but effective in the first half, relying primarily on Steven Jackson, back in action after an early season injury, and Tony Gonzales, who in the second half became just the fifth NFL player ever to tally 15,000 receiving yards. On the other side of the ball, Kirk Cousins’ performance was a mixed bag. Against Atlanta’s soft defense, Cousins posted better passing numbers than Robert Griffin III– spotted wearing warmups on the sideline– has this season, but a couple of interceptions proved costly. Washington nevertheless was in a position to take the game to overtime, or win it outright, thanks to a late touchdown that ran the score to 27-26. Opting to go for the regulation kill on the road, Mike Shanahan made like Brady Hoke and called for the two-point conversion, which failed. Atlanta recovered the sloppy onside kick to seal the one-point win. Having read about far more NFL games than I’ve attended, the game experience was a bit odd. 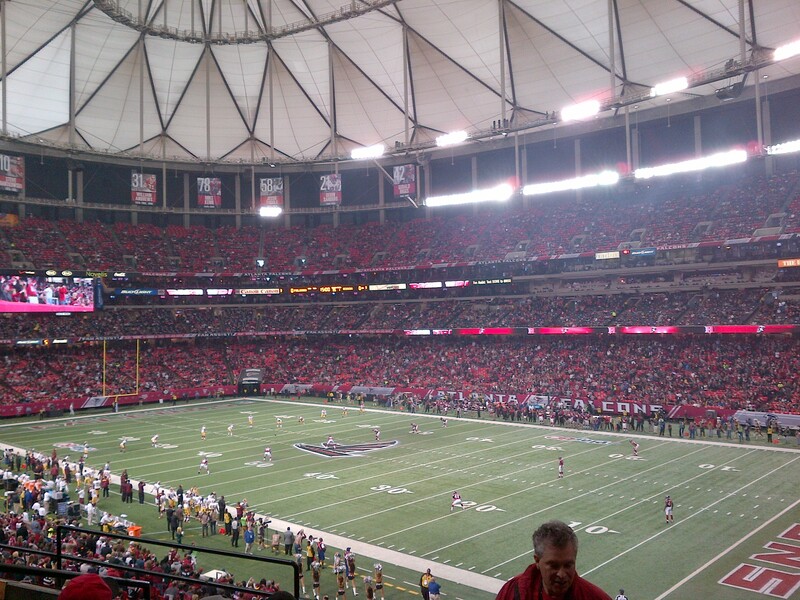 Even taking into account Atlanta fans’ reputation for lacking a feverish commitment to their teams, the vibe was beyond mellow in the Georgia Dome on Sunday. The noise level was somewhere between a Braves game and the Masters. One fan in our section who caught a free t-shirt used it as a pillow to rest. Another took a nap without similar support. And these weren’t alcohol-induced rests– the only even semi-drunk person we saw was a mom indulging in too much smuggled adult fruit punch– it really was that quiet. Our entire row, and most of our section, including the man pictured above who stood with his back to the field and wouldn’t get out of my picture even though I didn’t ask him to, left before the end of the third quarter, when the Falcons led by only four. The more-often-than-not decent MMQB used one of its “deep dives” to investigate what’s wrong with this year’s Atlanta Falcons, solidly in last place in their division with a 2-9 record after being a play away from the Super Bowl last year. A more difficult schedule meant that they were unlikely to match 2012’s 13-3 record, but they didn’t count on numerous early, crippling injuries on offense and defense. That’s the reason these Falcons have won just two games, and you only need a midseason “deep dive” to figure that out if you’ve been willfully ignorant of the team since August. Some believe Mike Smith and his staff will be fired. But that would be ludicrous. Smith’s .644 winning percentage is seventh best among active coaches. His Falcons are tied for third in victories since he took over in 2008, and this will be the first time during his tenure that they fail to finish above .500. A perfect storm of injuries is to blame, and nothing else.